What could ANZAC day mean to someone who has never known war, let alone experienced it? The thought of war sickens me. In my utopian mindset I believe all should, could live in peace and harmony. Embracing and accepting all, no matter ones colour, culture, beliefs or status. You don't need to be Einstein to know it's not and will never be the case. Simply switching on the TV, catching the news is enough to see. Something I choose not to do. Some would think I bury my head in the sand, others would wholeheartedly agree. It's one personal choice and personally I think why fill your mind and add to the collective consciousness of fear and worry, bringing to itself more fear and worry. I have had the privilege to meet and talk with some of Australia's war veterans. Everyday men called to duty by no choice of their own to fight in the front line in circumstances I could never (would never) imagine. This wonderful group of men gather each year with their mates to celebrate the life they and their families now live. And to comfort and share stories with each other of their days in the trenches. Many still bearing the physical scars but many carrying the psychological scars and wounds most of us will never see or know, for they are buried in the minds of these men. Each day traumatised, struggling to make sense of untold, unimaginable heartache, bloodshed and pain. Each day trying to move forward. I do not pretend to know or understand in any depth the pain and hardship these men and women had to endure (let alone the families that had to watch them leave. Left behind to hope and prayer. 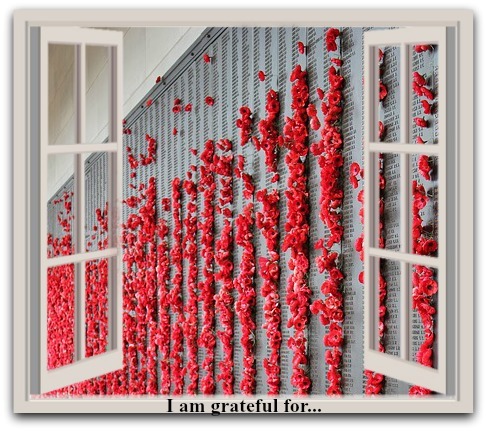 But like the majority of Australians I stand in awe, in silence, and remembrance of their dedication, their suffering to bring what many of us so easily take for granted - freedom. To them, I say thank you. My thoughts are with you.